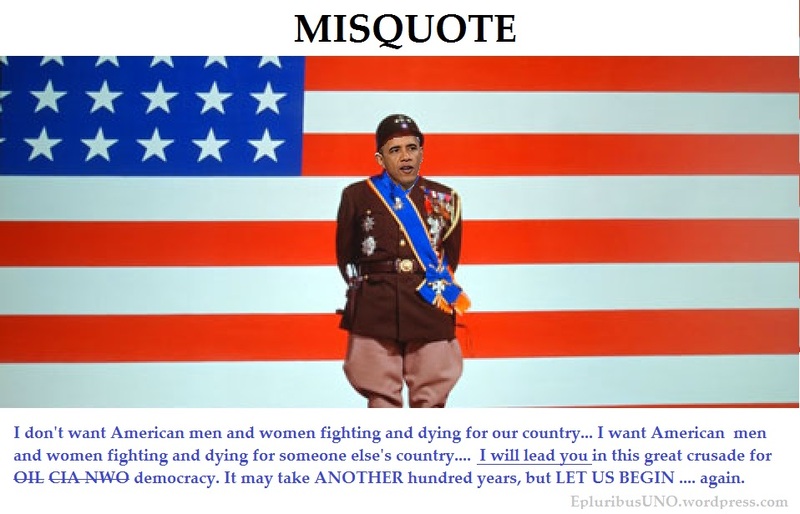 BARACK HUSSEIN OBAMA … was against invading Iraq as a Senator, against the “surge” until it was ‘successful'(and politically popular) campaigned on withdrawal of US troops from Iraq, regardless of the state of disruption caused by the original US intervention against international law. He cavalierly announced his timetable, to allow insurgents to plan ahead. NOW he wants to use air strikes and drone strikes to kill these same rebel fighters he supplied weapons to in Syria, from clandestine CIA operations in Libya, (which he illegally and unilaterally bombed under guise of a no-fly zone). This new offensive against now-well-armed Saudi-backed militias, fighting the US-installed Iraqi government, will be AGAINST Saudi Arabian interests, in conjunction with (Shiite) Iran and enemy-in-Ukraine, Russia. The Obama Doctrine seems to “sell as many weapons as possible, to as many sides as possible, and kill as many civilians as possible, as long as US controls the oil and maintains the petrodollar as world reserve currency”. So much for his world vision, his ability to pick and hold an ally, his military acuity… and his premature Nobel Peace Prize. One question remains… who will he blame this on?